Flash memory technology continues to evolve. We are transitioning away from spinning platters, as we move toward an all-flash future. It has been apparent for some time that solid state storage devices have been bottlenecked by the interface through which they connect to the rest of the system. Interfaces such as SCSI, SATA, and SAS have been terrific for spinning platters, but flash storage really needed a better, faster interface. All aboard the NVM Express! At first glance, you can see that the Iris NV1220 means business. A whopping 20 NVMe SSDs are shoehorned into a diminutive 1U rack chassis. As if that weren’t enough, it also sports a pair of the latest and greatest Intel Xeon SP processors. Top it off with 1600 watts of redundant power and dual-port 10G Ethernet. Explore your configuration options on pogolinux.com. Need even more superfast storage on your network? The NV2225 boasts 24 2.5″ NVMe drive bays, along with dual Intel Xeon SP™ processors, and 1600 watts of high-efficiency redundant power, in a cool 2U form factor. Configure yours now at pogolinux.com. Limited on rack space? The Iris NV1211 delivers a pair of the latest Intel Xeon Processors, along with 10 x 2.5″ NVMe SSDs. Combine this with redundant and super-efficient power supplies, and you have a package that punches way above its weight class. Check it out here at pogolinux.com. 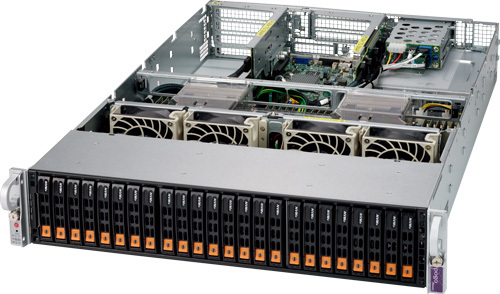 This entry was posted in Rackmount Servers, Server Solutions, Storage, Storage Solutions and tagged 1u, 2u, density, high-performance, NVMe, rackmount, storage. Bookmark the permalink.